State-run telecom giant Bharat Sanchar Nigam Ltd (BSNL) today reduced its EVDO based wireless Broadband Data card price and the launches irresistible offers of Unlimited downloading at just Rs.650 for its postpaid EVDO customers in Kolkata telecom circle. 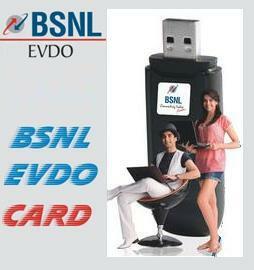 BSNL EVDO Data Card will now cost just Rs.2299. The operator also introduced promotional Fully Unlimited Downloads plan without any FUP at just Rs.650 for its postpaid subscribers in Kolkata circle. BSNL providing EVDO data card (Rev.A) whereby subscriber can able to access High Speed wireless Internet connectivity with peak speed up to 3.1 Mbps while on move. The operator also has Pay As per Use Plan for prepaid customers with default tariff of 5 paisa/100KB (50 paisa per MB) for data usage. BSNL was the first telecom operator to roll out EVDO Internet in India. The EVDO was launched unofficially back in September 2007 by BSNL in some parts of South Zone and now, after the establishing better EVDO network, BSNL has started to launch officially in most parts of the country. For more details on BSNL EVDO dial 1502 or visit any of BSNL Customer Service Centers across Kolkata. i m pravir can any one please let me know what is the speed we are getting in bilaspur chhatisgadh circle. tell me if it is availaible here in chikodi belgaum, karnataka area. and is the speed of downloading is good(approx 100kbps or more).